MCA Nashville’s Ashton Shepherd hit six cities in five days to celebrate the release of her album Where Country Grows. She played to a near capacity crowd at Cotton Eyed Joe's in Knoxville at a show sponsored by WIVK. Shepherd also stopped in Atlanta, where she is pictured here with (L-R): MCA’s Van Haze, WKHX PD Mark Richards, and WKHX MD Mike Macho. The 17th Annual Inspirational Country Music Awards will include appearances by Lee Greenwood, Joey & Rory, Ricky Skaggs and The Roys. Popular television personalities Storme Warren and Megan Alexander will host the Oct. 28 show at Nashville’s Schermerhorn Symphony Center. Erin Duvall is joining the CMT Radio team in Nashville today as Associate Producer. She has worked for AOL’s The Boot and Country Aircheck and recently relocated back to Nashville from Los Angeles. In this role, Duvall will be responsible for helping to produce CMT’s radio programming, representing CMT Radio at industry events, conducting artist interviews, as well as writing the network’s prep materials that are sent nightly to CMT Radio Network’s over 160 radio affiliates. Duvall will work closely with Curt Miller who has been promoted to the role of Producer, CMT Radio Network. 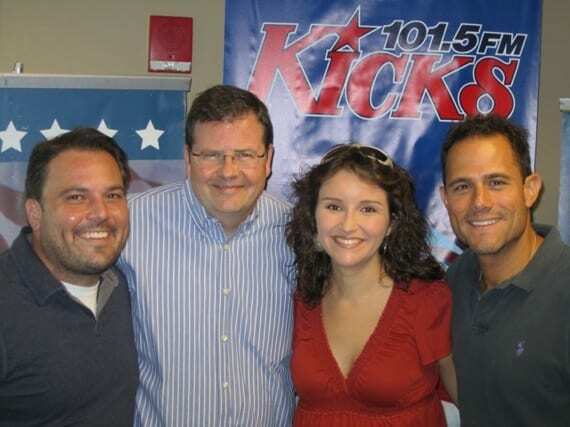 Miller joined CMT Radio in November 2010 and previously held the position of Associate Producer after working with Fox 17’s Tennessee Mornings for five years. Both Duvall and Miller report to Jean Williams, Director of CMT Radio. Turntable.fm has secured licenses with ASCAP and BMI. Users of the growing social music site join virtual crowds in themed rooms where they can listen to music selected by “DJs” or become a DJ themselves. The crowd can vote on each song selection and chat with each other. AirPlay Direct has hired Lee Williams as Manager of International Development. He is the founder and owner of European country music radio station CMR, which is in its seventh year of broadcasting. Each month it reaches nearly 500,000 listeners around the world.